This weekend I had several friends over to Mendenhall to squeeze in some social time before the summer caught up on us. Low humidity, a full moon, new and old friends, thousands of singing cicadas, delicious food and tequila cocktails make an exceptional evening. In my opinion, you never need an excuse to have a party – and summer is more than enough reason. Especially with the most fabulous seasonal fresh foods that hardly need any cooking. 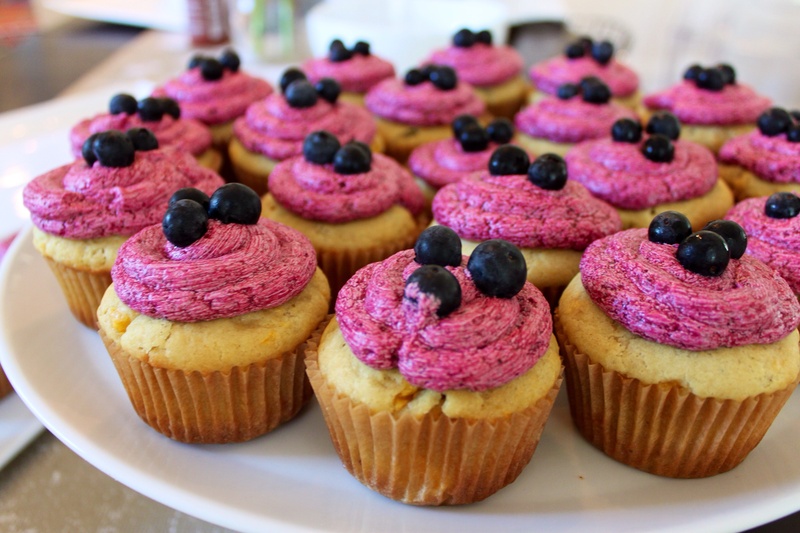 I made a spread of Korean BBQ tacos, fresh tomato salad, a grilled corn and zucchini salad, avocado cream dip and these most beautiful Summery Peach Cupcakes with Fresh Blueberry Icing. They are shockingly vibrant and a knockout on the table. 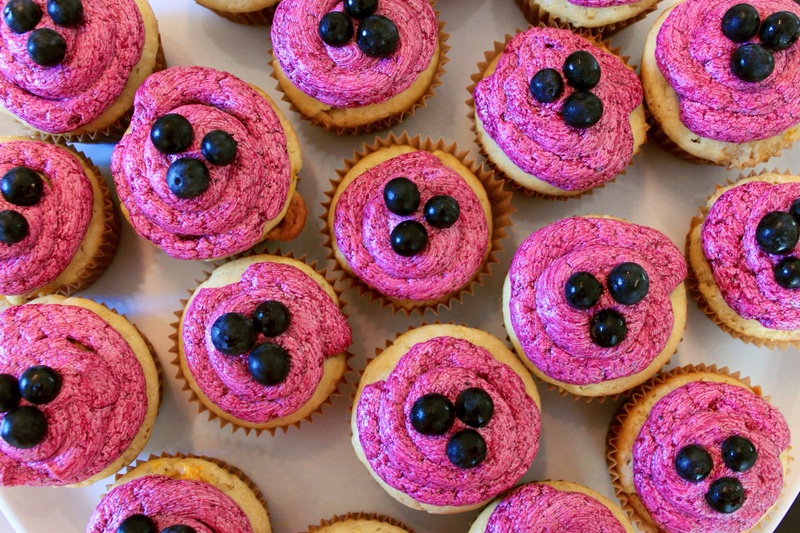 Just when you think you need food coloring, fresh blueberries bring an awesome pink to a traditional icing. And the super ripe peaches keep the cake so moist. I picked up fresh peaches, blueberries and eggs from the Greensboro Farmers Curb Market, which made them even more delicious and special. Make these immediately. You need no excuse. Cream the butter and sugar together, beating until fluffy. Add the eggs, one at a time, scraping down the sides and bottom of the bowl between each addition. Gently add the vanilla and buttermilk. Stir in the dry ingredients until combined. Fold in the peach chunks with a spatula. Divide the batter evenly among the prepared cupcake liners. Bake for 18 to 20 minutes, or until a tester inserted into the center of cupcakes comes out clean. Cool the cupcakes for five minutes in the tin, then turn them out onto a wire rack to cool completely. Put blueberries and water in a small saucepan and cook on medium for about 10 minutes (stirring) or until blueberries are super plump and starting to break down. Push the cooked blueberries through a fine mesh sieve with the juices going into a bowl. Discard the skins that stay in the sieve. Set aside until cool, or place in refrigerator to speed up the process. In the bowl of an electric mixer fitted with the whisk attachment, whip the butter until fluffy and white. Make sure to scrape the sides occasionally. Add the confectioners sugar to the whipped butter a cup at a time mixing on high between additions. Add vanilla and blueberry concentrate to mixer and mix until combined. Whip frosting 1-2 minutes or until fluffy, but be careful not to over whip. Spread frosting onto cooled cupcakes.